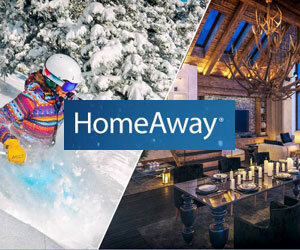 Find your own ski in and out by owner rental in Sun Valley-click on this link! Pick your own By Owner Vacation Rentals here for Sun Valley from the full list - with hot tubs, ski in and out, instant booking, fireplaces! 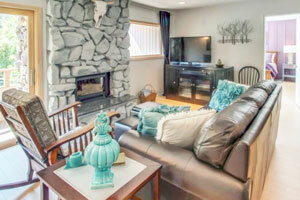 One minute walk to ski lifts- Waterfront Home with Shared Hot Tub and Pool!, Sleeps 2, from $111/nt-- Book it! VRBO 659665 -Whether you want to ski or not, this Ketchum studio vacation rental is sure to delight. With community amenities galore, including a year-round pool, as well as a short jaunt to the ski lifts, any traveler would love this cozy two-story condo! Challenger and Greyhawk lifts on Bald Mountian are just one minute away and you're close to the Bald Mountain Inn. The heart of Sun Valley and downtown Ketchum are also only moments away by car. You're never far from the action, ski or non-ski. This condo feels bigger than it looks, thanks to a spiral staircase that winds it way up to an open second floor. The living area is thoughtfully furnished with a cream carpet, a red woven sofa bed and a printed chair. Floor-to-ceiling windows bring in tons of light and the sliding glass door leads onto a cozy balcony with a gas grill for entertaining. Cozy resort condo w/shared hot tub within walking distance to ski lifts-Sleeps 4 in One bedroom, One bath, from $105/nt -- Book it! VRBO 749301 -The mountain condo is two blocks from the Sun Valley Warm Springs lift and two miles to town (ride the shuttle for free)! A shared sauna is located right outside your door, and Sun Valley offers year round fun. Play Soleil is a second-story condo accessible by stairs only. The home is ideal for entertaining with a spacious living room, fireplace, and media entertainment (cable and DVD library). A fully stocked kitchen and bistro table will help feed the whole family or you can always dine on the private patio thanks to a gas grill! With one full bath and one bedroom, this Ketchum condo sleeps four guests. Bedding options include a queen-size bed and sofabed in the living room. In-house WiFi and a private washer and dryer will keep guests cozy for extended stays. 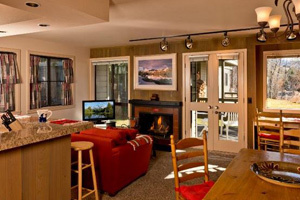 Sun Valley Cottonwood Condo - 1 Bedroom, 1 bath, Sleeps 4, from $139/nt-- Book it! Trip Advisor #FKN2301285 -This darling remodeled single-level condominium is the perfect Sun Valley retreat! This unit is situated on the first level of the Custer Building, as you enter you will find the bedroom with a King bed and a small TV with DVD, plenty of closet space. The kitchen was remodeled complete with granite countertops, newer appliances and finishes. The living room includes a gas fireplace, a comfy sofa that is also a Queen sofa sleeper for extra guests and a 32' TV with DVD and cable. The dining area is adjacent to the living room and kitchen and seats 6 comfortably. There is a small nook in the living room with a built in desk should you need a workspace while here. There is a large deck off of the living room for the summer months. Wireless internet is offered in this condo as well. Your full size bathroom is adjacent to the bedroom. A stackable washer/dryer is located in hall for your convenience. 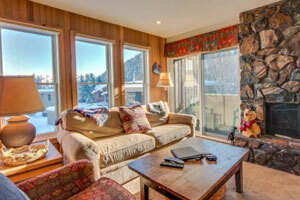 Rental of this unit includes access to Sun Valley amenities! There are lockers at the base of the mountain for ski and boot storage so you can hop on the free shuttle in front of the complex or you can just take a stroll over to the River Run side of Baldy. Cozy, dog-friendly home w/shared hot tub - walk to Bald Mountain ski lifts! Sleeps 6, 3 bedroom, 3 bath, from $200/nt-- Book it! VRBO 812452 -Ski on world-class slopes and have the mountain getaway you've always wanted at this dog-friendly Ketchum vacation rental. Just steps away from the slopes at Bald Mountain, it has beautiful mountain views, a rustic fireplace, access to a community hot tub, and enough space for your group of up to six guests! The location of this home is an outdoor enthusiast's dream! Take a short walk to the Challenger and Greyhawk ski lifts, which will shuttle you to the top 9,150-foot Bald Mountain. Ski down powder-laden slopes, or bring your mountain bike to zoom down amazing singletrack trails! There's also a nearby shuttle that will take you into the heart of downtown Ketchum, where great shopping, dining, and entertainment await! Cozy and inviting with comfortable furnishings, wall-to-wall carpet, and lovely views out of picture windows, this modern mountain home has a cozy cabin-like feel that will immediately put you at ease. The rooms are spacious with mountain-themed decor, plush seating, and even offer modern conveniences like cable TV, a DVD player, WiFi throughout, and modern appliances. Quickly warm the living room using the gas fireplace and gather your group to play a fun game of Scrabble, BalderDash, Big Boggle, or Outburst - all of which are in this home for your use! 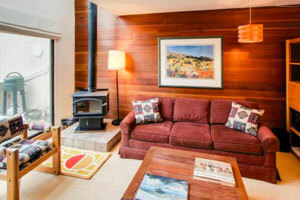 Ski in and Out at the Base of Baldy- 4 bedrooms, 4 baths, sleeps 12, from $1000/nt- Book it! 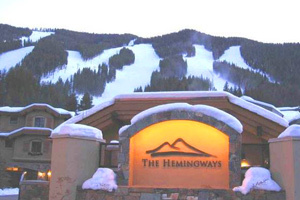 Trip Advisor #FKN3367425 -Our condo is located at The Hemingways, an 8-unit condominium complex, located at the base of Bald Mountain in world famous Sun Valley, Idaho. You can enjoy skiing & sledding steps away from your front door during winter season; and some of the best hiking, biking, fly fishing and white water rafting in the summer. Your residence will be located in Warm Springs Village facing the mountain. It is 4,100 sq. ft. (including a two-car heated garage) unit with 4-bedroom, 4-bathroom, great room, family room and office with spectacular views. The residence includes a heated deck, barbeque, two full entertainment systems with CD, DVD capacity, real wood burning fireplace in the great room and gas fireplace in the master bedroom. There are two masters with a king bed and two bathrobes in each, 1 queen room, 1 twin (2 beds) room and two queen sleeper sofas (12 person maximum). The office includes a high-speed internet connection, fax/printer/copier with a dedicated phone number. There is also a washer/dryer and a safe. We provide salt, pepper, spices, coffee filters, dish soap, sponge and dishwasher detergent in the kitchen and soap, shampoo, conditioner, tissue, toilet paper and a blow dryer in each bathroom. Laundry detergent and bounce are provided in the laundry room. 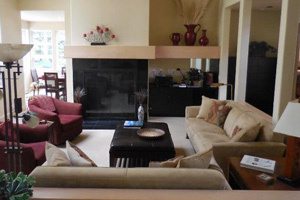 Spectacular Large Contemorary Home, 5 bedrooms, 5 baths, sleeps 13, from $1000/nt- Book it! Trip Advisor #FKN3868221 -This spectacular 5200-square-foot Elkhorn home, with mountain views from every room, refreshes you from the moment you enter. The airiness of its handsome contemporary architecture, with floor to ceiling windows, the spaciousness of rooms, and the warmth of its completely new dÃ©cor combine to create the perfect ambiance for a relaxing and memorable vacation with a large family or a group of friends. The home is located directly across from the 18th fairway of the Elkhorn Golf Course, beside the bike path that runs throughout the valley, very near a stop on the free bus route, less than a mile from Dollar Mountain and a 10 minute drive from the River Run ski lifts. In the winter Elkhorn maintains a cross country ski trail on the golf course which is accessible directly across the street from the house. The home is thoroughly 'wired' with wireless internet, extended cable service, and unlimited domestic long distance calling. There are two 61inch  plasma screen TV's, one in the Media Room off the kitchen and the other in the Master Bedroom, both of which also have VCR and DVD players. (In addition the Media Room audio/visual complex includes a laser disk player, including 100 laser disks of classic movies, concerts, full length operas, and many other selections.) There are also three smaller flat screen TV's in the house and another easily portable DVD player.